Foolish to believe the job market drives the stock market? It may be foolish to put too much weight into this week’s non-farm payroll report to decide whether to buy or sell. Since the onset of the financial crisis in 2008, the stock market has tracked the Federal Reserve’s “printing press” rather closely. 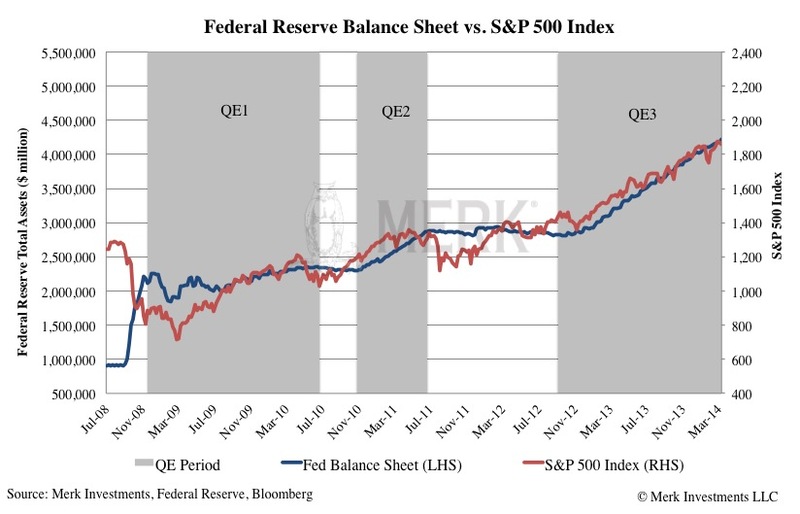 We allege that the rise in the stock market has a lot more to do with the Fed’s asset purchases than a healing economy. 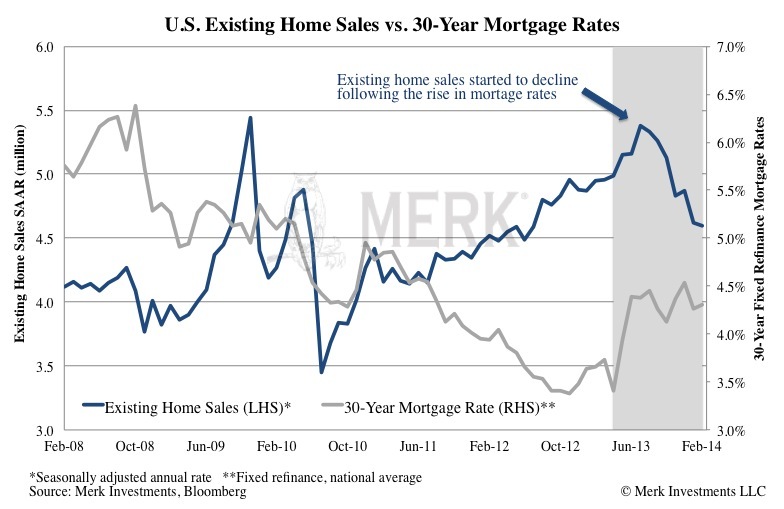 The Fed has had an interest in pushing up asset prices because “underwater” homeowners (homeowners that owe more on their home than it is worth) don’t make for good consumers. By boosting home prices – and the stock market while they are at it – consumption and economic growth might be boosted as well. The problem with all this is that asset price inflation, especially in the stock market, can evaporate rather quickly. To prove this point consider that the “taper talk” that started a year ago rocked not just the bond market but also signaled to homebuyers that cheap mortgages may be a thing of the past. And although mortgage rates are still low by historic standards, housing market activity has been disappointing. The weather has been blamed but if one slices the numbers into different geographic regions our analysis clearly suggests that it is the anticipation of higher rates that is spoiling the party. Differently said, the Fed has been able to boost home prices but if we truly had a rising interest rate environment all the “progress” may quickly be undone. Below is a chart of seasonally adjusted annualized monthly existing home sales; other views of the housing market show the same loss of momentum starting a year ago. Foolish to put your money with the “Cleanest of the Dirty Shirts”? As much as we respect the wisdom emanating from Newport Beach, the quote that the U.S. may be the “cleanest of the dirty shirts” left the impression with many investors that the U.S. is the place to invest. By all means, we don’t doubt there are investment opportunities in the U.S. but just as Apple, for example, may be a great company, it doesn’t mean one necessarily makes money buying AAPL stock (this is not an investment recommendation). Investors learned the hard way that going with the perceived leader is not always a profitable investment strategy. All excited about the U.S. “clean shirt” many investors haven’t realize that despite all the trouble in the Eurozone the euro beat the greenback in 2012, then again in 2013 when the euro was the best performing major currency, and it is also up versus the dollar in the first quarter of 2014. There are plenty of challenges the Eurozone faces, but that doesn’t mean investors have to stay away from the euro. Similarly, there are lots of myths that have little to do with reality; among them that the dollar benefits from a rising interest rate environment, or that economic growth is needed for a strong currency. Please see our analysis Rising Dollar Myth for suggestions on how to avoid being fooled when it comes to assessing the value (or fragility?) of the dollar. Foolish to believe the market is your friend? There is a lot of talk about market manipulation, not just in the gold conspiracy camp but also when it comes to alleged market manipulation by high frequency traders (HFTs). In any market there may be some players that break the rules and they deserve to be prosecuted. However, let’s not forget with whom we are dealing: with the market. The market is not a friend you "like" on your favorite social media platform. No, the market is everyone else trying to make money off you. If you take the gold market, there’s a paper and a physical market. The “paper” market is one where derivatives rule, allowing investors to make leveraged bets. After 12 years of rising gold prices it shouldn’t have come as too much of a surprise that some investors geared up their gold exposure using leverage. A year ago as volatility surged, partially driven by the Fed’s taper talk, lots of de-leveraging took place as volatility is the enemy of leverage. It’s not surprising that this can lead to a disconnect between the paper and the physical market as those interested in the physical metal are more likely to be non-levered players that have not received margin calls. What’s different with commodities is that there is real demand for real things. Conversely, financial products, even without leverage, are still “paper” products. As such, allegations of manipulation may be more likely to occur however, the underlying drivers for potential dislocations of derivatives are not all that different. The concern many have is whether any de-leveraging can happen in an orderly fashion. For purposes of this analysis, we simply want to drive home the point that it shouldn’t come as a surprise that markets behave in ways that can irritate the long-term investor. No regulation will ever change that so it may be better to embrace this in one’s investment decisions. Let me expand on another example as to why it may be foolish to think the market is working on your behalf. When you place an order on an exchange for 100 shares you might be able to get “best execution.” But if you place a larger order you better “work” that order. Why would someone give you your preferred price? To illustrate this, let’s examine high frequency trading shops (HFTs) HFTs are in the market to make a buck for themselves. In the process they provide liquidity for everyone. To look at an example, some of the good and bad can be seen in the foreign exchange markets. Historically, banks are the primary liquidity providers in foreign exchange. Foreign exchange trading is generally done “over the counter” (OTC) but there are platforms that provide various ways of trading. HFT shops try to beat banks at their own game. HFTs might be good at taking advantage of idiosyncrasies of a particular trading platform. Banks realize they lose money on that platform because they get beaten by HFTs. They now have to choose whether to invest to also take advantage of the idiosyncrasies of that particular platform or whether to stop providing liquidity there and focus on other platforms. Combined with a surge in regulatory overhead, there’s an incentive in the industry to consolidate, i.e. concentrate on fewer platforms. As the big banks leave some platforms, other investors also desert the venue. So you tell me: are HFTs the bad guys because they scared away the banks? Or are the banks high frequency traders themselves, but with a better reputation (that’s quite a statement in today’s environment that someone has a worse reputation than banks) who happen to be asleep as competition entered the market? I’m not trying to justify banks for HFTs but want to show that every investor is in the markets for their own profit. The role of regulators is to align incentives so that greed can play out without taking unfair advantage. Regulators cannot regulate away bad decision-making, however, regulators can help design a system where bad decisions of any one player (the failure of a player) does not destroy the system as a whole. But just because someone is screaming that someone else is eating his or her lunch does not yet mean there is abuse. Importantly, as regulators get involved, I’m not optimistic that investors or any other stakeholders (other than lawyers) will be better off. For more on how to not be a fooled in the markets please register so you are notified when we hold a webinar. Our next Webinar is Thursday, April 17, 2014. Also, don’t miss another Merk Insight; sign up for our newsletter.